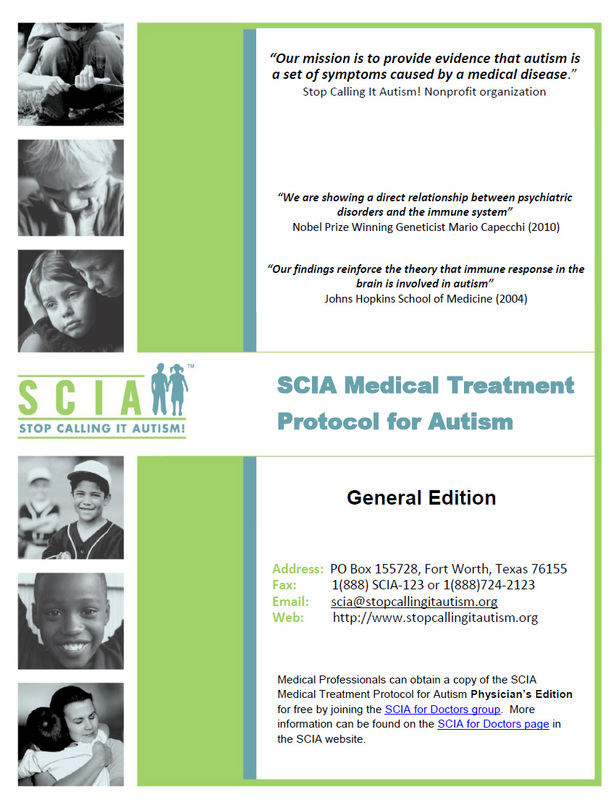 The material on this Web site is provided to educate the public about Stop Calling It Autism! 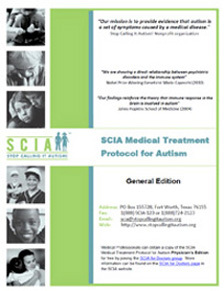 (Stop Calling It Autism!, SCIA, we, our or us) and our products and services. The information provided on the Web site is not intended nor recommended as a substitute for professional medical advice, is for general information only, and is designed to support, not replace, the relationship that exists between you and your physician. Stop Calling It Autism! and our officers, directors, employees, agents affiliates, related companies, licensors, contractors, and suppliers do not provide medical services or advice as part of this Web site and nothing contained on this Web site is intended to be used for medical diagnosis or treatment. Always talk with your doctor if you have questions about your symptoms, diagnosis and treatment. We control and operated this Web site from the United States of America. Our mailing address is Stop Calling It Autism!, P.O Box 155728, Amon Carter Blvd, Fort Worth, Texas 76155. Carefully review these terms and conditions. By accessing and using this Web site, you agree to follow and be bound by these terms and conditions. Your acknowledge (i) that you have read and understood these terms and conditions and (ii) that these terms and conditions have the same force and effect as a signed agreement. If you do not agree to follow and be bound by these terms and conditions, you may not access, use, or download materials from this Web site. Stop Calling It Autism! reserves the right to update or modify these terms and conditions at any time without prior notice. We will post modified versions of the terms and condition on our Web site and note the last revised date at the top of these terms and conditions. You will be notified of changes to these terms and conditions via a notation next to the link to these terms and from the main page of this Web site stating that the Terms are new/modified and the state on which they were updated. We encourage you to review these terms and conditions every time you use this Web site. Your use of this Web site constitutes your agreement to follow and be bound by the most recent version of the terms and conditions. Stop Calling It Autism! reserves the right to modify or discontinue this Web site (or any portion of this Web site), temporarily or permanently, with or without notice to you, and is not obligated to support or update this Web site. Stop Calling It Autism! shall not be liable to you or any third party in the event that we exercise our right to modify or discontinue this Web site (or any portion of this Web site). Unless explicitly stated otherwise, any new features that augment or enhance the current Web site shall be subject to these terms and conditions. You do not modify the content or graphics. You do not copy or distribute graphics separate from their accompanying text. You do not quote content out of its context. You display the Stop Calling It Autism! copyright notice and any trademarks on all documents or portions of documents and retain any other copyright and other proprietary notices on every copy you make. You agree that Stop Calling It Autism! may revoke this permission at any time and you shall immediately stop your activities related to this permission upon notice from Stop Calling It Autism! Except in relation to printing or distributing unmodified content from the Web site, the permission above does not include permission to copy the design elements, look and feel, or layout of this Web site. Those elements of the Web site are protected by law, such as trade dress, trademark, unfair competition, and other laws, and may not be copied or imitated in any manner. Stop Calling It Autism! is the content owner, unless otherwise indicated. The Stop Calling It Autism! Website content is protected by U.S. and foreign copyright and trademark laws. If you use the materials or trademarks on this Web site in a way that is not clearly allowed by these terms and conditions, you are violating your agreement with us and may be violating copyright, trademark, and other laws. In that case, we automatically revoke your permission to use this Web site. Content and features are subject to change or termination without notice in the editorial discretion of Stop Calling It Autism!. All rights not expressly granted herein are reserved to Stop Calling It Autism! and its licensors. Stop Calling It Autism! has used reasonable efforts to make this Web site as timely and accurate as possible, but because errors may occur, this Web site is provided as is and as available without any representation or warranty, express, implied or statutory as to the operation of the Web site or the information, content or materials included on the Web site. To the full extent permissible by applicable law, Stop Calling It Autism! specifically disclaims any implied warranties of title, merchantability, fitness for a particular purpose and non-infringement. Without limiting the foregoing, Stop Calling It Autism! does not represent or warrant that the information on the Web site is accurate, complete or current or that the Web site will operate without interruption or error or that the Web site will operate in a completely secure manner. Stop Calling It Autism! will not be liable for any claims, charges, demands, damages, liabilities, losses and expenses of whatever nature and howsoever arising from the Web site, its services or these terms and conditions, including, but not limited to compensatory, direct, indirect, incidental, special, punitive or consequential damages (however arising including negligence), loss of use, loss of data, loss caused by a computer or electronic virus, loss of income or profit, loss of or damage to property, claims of third parties or other losses of any kind or character, even if Stop Calling It Autism! has been advised of the possibility of such damages or losses, arising out of or in connection with the use of this Web site or any Web site. This limitation on liability applies to, but is not limited to, the transmission of any disabling device or virus that may infect your equipment, failure or mechanical or electrical equipment or communication lines, telephone or other interconnect problems (e.g., you cannot access your internet service provider), unauthorized access, theft, bodily injury, property damage, operator errors, strikes or other labor problems or any act of god. Some jurisdictions do not allow the limitation or exclusion of liability. Accordingly, some of the above limitations may not apply to you. Stop Calling It Autism! is not responsible for any errors or omissions in or for the results obtained from the use of this information. Use of the Web site and the materials available on the Web site is at your sole risk. Some portions of the Web site are hosted by third-party service providers. Stop Calling It Autism! cannot be held responsible for any loss arising from the transmission, use of data, or inaccurate data provided by these service providers. You are responsible for taking all necessary precautions to ensure that any material you may obtain from the Web site is free of viruses or other harmful components. You hereby agree to indemnify and hold harmless Stop Calling It Autism! from and against any and all claims, charges, demands, damages, liabilities, losses, expenses, and liabilities of whatever nature and howsoever arising (including but not limited to any legal or other professional fees and the costs of defending or prosecuting any claim and any loss of profit, goodwill, and any other direct or consequential loss) incurred or suffered by Stop Calling It Autism! directly or indirectly by reason of (i) your use of or access to the Web site; (ii) your violation of these terms and conditions; (iii) any activity related to your Internet account (including negligent or wrongful conduct) by you or any other person accessing the Web site using your Internet account; (iv) from any transaction you conduct as a result of the contact facilitated by the Web site; (v) from your property posted on the Web site; or (vi) from your infringement of any intellectual property rights in any posting to or transmission via the Web site. link directly or indirectly to any materials to which you do not have a right to link to or include. Stop Calling It Autism! reserves the right (but not the obligation) to monitor all user postings and to remove any postings, including those which Stop Calling It Autism! considers in our absolute discretion to be offensive or otherwise in breach of these terms and conditions or any applicable law or regulation. You grant Stop Calling It Autism! a non-exclusive, worldwide, perpetual, irrevocable, royalty-free, sublicensable (through multiple tiers) right to exercise, commercialize and exploit the copyright, publicity, and database rights (but no other rights) you have in your submission, in any media now known or not currently known, with respect to your submission. Please be aware that if you transmit any ideas, information, concepts, comments, feedback, notes, messages, know-how or techniques or materials to us through this Web site, your submissions shall become the exclusive property of Stop Calling It Autism! and can be used by Stop Calling It Autism! or our affiliates for any purpose without compensation to you. You also agree that immediately upon the creation by or on behalf of Stop Calling It Autism! of any derivative works from, modifications, edits or other changes to the materials you transmit to us through this Web site (the modified content), the modified content will become the sole and exclusive property of Stop Calling It Autism! and that Stop Calling It Autism! will own the entire right, title and interest in and to the modified content, including the right to secure copyright registration for the modified content and to otherwise use the modified content for any purpose as determined by Stop Calling It Autism! in our sole discretion. You hereby grant, assign, transfer and convey any and all right, title or interest you have or may be deemed to have in and to the modified content to Stop Calling It Autism!. 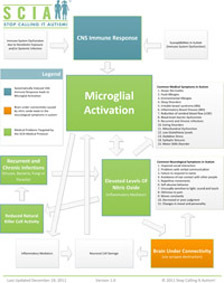 The Web site content, including, for example, all page headers, images, illustrations, graphics, audio clips, video clips, and text, are subject to trade dress, copyright and/or other intellectual property rights or licenses held by Stop Calling It Autism!, by our affiliates or by third parties who have licensed their material to Stop Calling It Autism!. The entire content of the Web site is protected under U.S. copyright laws, and Stop Calling It Autism! owns a copyright in the selection, coordination, arrangement and enhancement of the Web site content. In the event that any provision of these terms and conditions shall, in whole or in part, be determined to be invalid, unenforceable or void for any reason, the determination shall affect only the portion of the provision determined to be invalid, unenforceable, or void, and shall not affect the remainder of that provision in any way. You agree to allow a court or arbitrator to replace such an invalid, unenforceable, or void provision with a valid provision which is as similar as possible in substance to the invalid, unenforceable, or void provision. Stop Calling It Autism! 's failure to act with respect to any breach by you does not constitute a waiver of our right to act with respect to subsequent or similar breaches. These terms and conditions shall be governed by and construed in accordance with the laws of the state of Texas without regard to its choice of law provisions. In the event of any conflict between foreign laws, rules and regulations and those of the United States, the laws, rules and regulations of the United States shall govern. The United Nations Convention on Contracts for the International Sale of Goods will not apply to these terms and conditions. You hereby consent to personal jurisdiction by the state and federal courts located in Denton County, Texas. Stop Calling It Autism! may assign our rights and duties under these terms and conditions without such assignment being considered a change to the terms and conditions and without notice to you. You may not assign these terms and conditions without the prior written consent of Stop Calling It Autism!. These terms and conditions, any operating rules, policies, or procedures that may be posted from time to time by Stop Calling It Autism! on this Web site, and any modifications to the foregoing, constitute the entire agreement between the parties with regard to the subject matter hereof and supersede all prior understandings and agreements, whether written or oral, as to such subject matter. Nothing contained in these terms and conditions shall be deemed to constitute either party as the agent or representative of the other party, or both parties as joint venturers or partners for any purpose. If you have any questions regarding these terms and conditions of this Web site, please contact us.